For the 70th commemoration of the renowned D-day Invasion, which is to take place in June 2014, a group of parachutists called the Round Canopy Parachuting Team, has set its goals at assembling as many as possible still flying Douglas C-47 Dakota’s at the airport of Cherbourg, Maupertus.Founded in 2009 and with our main activities in Europe and the United States, the Round Canopy Parachuting Team is a foundation aimed at conducting parachuting activities with an emphasis on World War II style round canopy jumps and at conducting memorial services to honor Allied soldiers who fought and died to restore Europe’s freedom. Over the weekend we have talked to Peter Braun, Director of Operations of “Dakotas Over Normandy” project. HERE you can read our previous article about this ambitious mission,“It is now January 2014 and a good start has been made for the preparations of our events. We have had successful talks with the local and regional authorities, as well as other parties who are involved in festivities surrounding the 70th Commemoration of the D-Day invasion. “Daks over Normandy” will officially be a part of all!” – Peter said. The official poster of the event. Peter reported the excellent cooperation that was established with SNC-Lavalin, the operator of the airport in Cherbourg-Maupertus. The Airport has graciously offered to renovate an old taxiway and provide Daks over Normandy a large space dedicated to park othe historical aircraft, enabling the general public to come see and touch the airplanes. “During the scheduled events, all parachutists will prepare themselves for their jumps, at the Cherbourg-Maupertus airport, in close proximity to the aircraft. The combination of aircraft and parachutists will result in beautiful images, ensuring that a visit to the event will be a special experience” Peter added. The provisional program of events has also been put together. 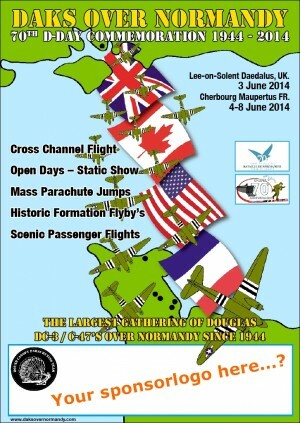 On the 3rd of June, Daks over Normandy will start at Daedalus Airport, Lee-on-Solent in the United Kingdom. Preparations are under way for a large memorial service in the City of Portsmouth, a historical fly-by and an evening program with a swing style music concert is scheduled. 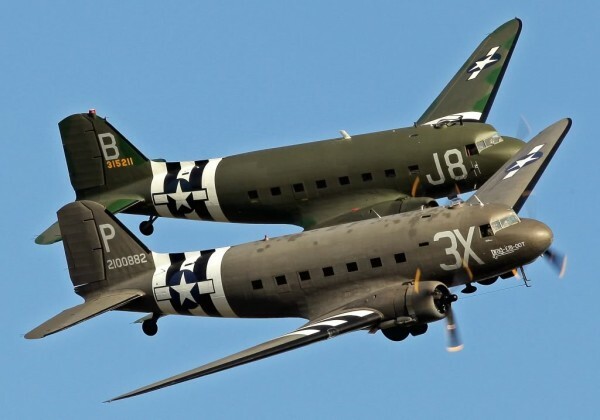 On the 4th of June, all DC-3/C-47 aircraft, possibly escorted by Spitfires and Mustangs, will cross the English Channel together. 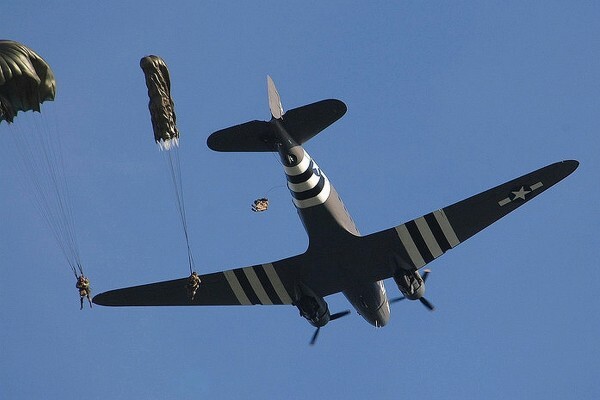 The aircraft will then participate in a mass parachute drop in Carentan, Normandy, upon reaching France, and conclude these historic flights at the Cherbourg-Maupertus airport. Not since 1944 has Europe seen such an image of grandeur in the sky and this act of historic remembrance is definitely one not to miss. 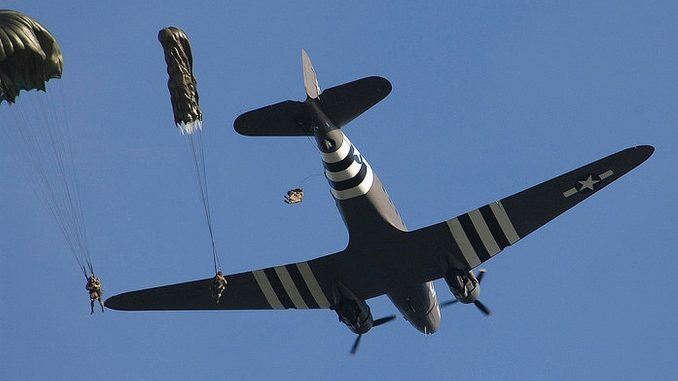 On the 5th, 6th, 7th and 8th of June, the gates of the airport will be open to the public and parachute jumps will be made into a number of historical drop zones, throughout the Normandy region. One of the most important meetings is planned for next week with Air Total to discuss the donation of the considerable amount of aviation fuel required for the event to take place. I’ll be there, not as a trooper, but as an observer. I always participate at the Battle of the Bulge Commemorative Walk in Bastogne. In 2009 We were able to tour the Battlefield of The Battle of the Bulge! It remains just as it was, Foxholes and All! It was such a High Privilege to walk on that Hallowed Ground where such Brave Men fought! The US Army had us jump there in 2006; any chance of two old paratroopers getting in on a jump?